This year we celebrate the 100th anniversary of Woman Suffrage in New York State. Once women were given the right to vote they had to register. If you go to Ontario County Records and Archives you can see the records of registered voters for 1917. By the time women got the right to vote men were already registered for the year, therefore women are listed in a group under the men on each page of registered voters. In the 1906 Geneva City Directory Nellie Patridge is listed under her own name. Most pages have only a few women listed compared to the number of men. The surprising thing is that some of the women who registered were also part of the anti-suffrage movement. Who would have thought they would take advantage of the right to vote? What prompted them to register? Since I have not found a local woman’s diary with her thoughts on the matter I would surmise that these women felt once they had the vote they might as well use it to make certain this new freedom did not get out of hand. Or perhaps women realized they finally had a voice and the possibility of their own identity and thought it might be worth taking advantage of the opportunity. Or perhaps women were feeling ignored. A good example of how women’s identity was perceived is unintentionally given in the book the Story of Geneva, a history of our city written by E. Thayles Emmons. This book, first published in 1931, has 51 pages of brief biographies of men and only 12 and a half pages of biographies for women. That is more than 4 times as many men as women. Also, when you married your individual identity may vanish entirely. You became Mrs. Thomas A. Kane or Mrs. James Leamy instead of Miss Rhoda Palmer. In most cases it is easy to look up a woman’s given maiden name, but sometimes it is hard to find out what first name was given to them at birth. From the first United States Census in 1790 until the federal census of 1850 no one but the head of the house was identified on the census. For the first 60 years of the census women, children, servants, and slaves showed up as a check mark by age group. With very few exceptions only men were identified in the census by their first and last names. 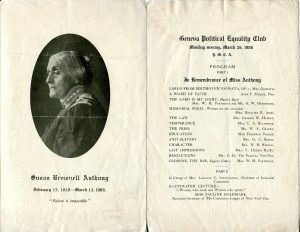 Unlike the 1906 Geneva City Directory, this 1906 Geneva Political Equality Club program lists Nellie Partridge as Mrs. W. H. Partridge. I wonder if women thought about how it felt when they registered to vote using their own name, for instance Mrs. Cecil McKay of Washington Street registered as Edith McKay. It had become more common to find women identified by their own first names for some time. If you were an adult woman who had a job or owned a business you were listed in the City Directories from 1894 on by your own name. If you were a widow you would be listed by your first name and usually followed by the name of the man who died. 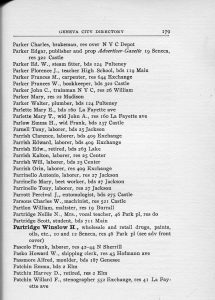 By the time the 1917 City Directory came out if you were a student or an adult woman living in the city you were also listed by your first name. Prior to the early 1890s the majority of married women not employed outside the home were not listed separately from their husbands; a tradition that continued into the 1930s. I am sure many women did not look at it as losing their identity when they became Mrs. Edward or Mrs. John Doe, but it had that effect. Genealogists find it much more difficult to track the history of the women on their family tree than men in part because they are disguised by their husband’s name. Even in the latter part of the 20th Century it was quite uncommon for women to retain their own name when they married. Few of the women I knew in the 1970s, 1980s or even the 1990s kept their maiden names. Usually if a woman kept her surname it was because she had a career and changing names would have been confusing. However, in the 21st century it has become much more common for women to retain their names or hyphenate them with their husband’s name. We have come a long way, but not nearly far enough. Hopefully the years of the 21st century will see more women recognized for their ideas, and contributions to society and not just who they married.